Russian Prime Minister Dmitry Medvedev's Twitter account "has been hacked" and the latest tweets posted on it are not true, a Russian government spokesman told Interfax. A tweet appeared on Medvedev's account on Thursday morning claiming that the prime minister was allegedly going to resign. "I am resigning. Ashamed of the actions of the government. I'm sorry," wrote the intruders on behalf of Medvedev on his Twitter account. "The premier's Twitter account has been hacked and the latest tweets do not correspond to reality," the spokesman said. The circumstances surrounding a hacking attack on Russian Prime Minister Dmitry Medvedev's Twitter account have not yet been established, but all the technical measures needed to deal with the consequences of the incident are being taken, a Russian government spokesman told Interfax. In an interview with Interfax, the government's press service confirmed the incident and said that the latest tweets posted on the prime minister's Twitter account "do not correspond with reality." 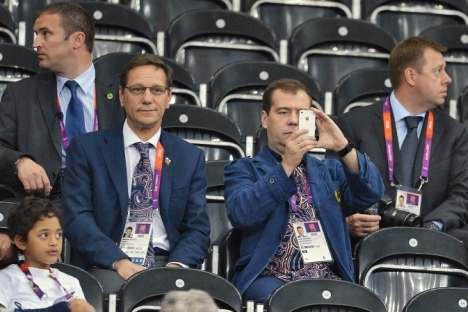 A number of tweets appeared on Medvedev's page at 9:00 a.m. on Thursday. Some of them claimed that he was allegedly going to resign. All these fake tweets were deleted as of 11:00 a.m.